For most of his career Brad Pitt has remained a very private individual, but now Brad Pitt and Google+ are friends. 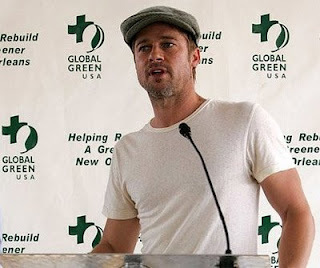 Avoiding Facebook, Twitter, and numerous other social media sites, Brad Pitt decided to give Google+ a shot. The cool part about Brad Pitt and Google+ is that the star isn’t using the site to increase his fans or to make more money, but rather it is for his charity, “A Night to Make it Right,” which focuses on helping the communities still negatively affected by the aftermath of Hurricane Katrina. “On March 10 at Hyatt Regency New Orleans, Brad Pitt and Ellen DeGeneres will host “A Night to Make It Right” with special guests Randy Jackson and performances by Rihanna, Sheryl Crow, Seal and local favorite Dr. John and friends. The benefit gala will raise vital funds for the completion of 150 environmentally friendly homes. If you don’t remember Dr. John, then you should definitely take another look at Martin Scorsese’s The Last Waltz, which showcases legends The Band along with a wonderful performance by New Orleans’ native piano player Dr. John. We are all hoping that Brad Pitt and Google+ are a hit, because this is a very just cause. A lot of folks out there don’t realize that there are still thousands of people out there suffering from the aftermath of Hurricane Katrina. So sharing this message across your own social media pages whether it be Twitter, Facebook, or Google+ could really make a huge impact in the lives of New Orleans’ natives that are still feeling the pain of the disaster that happened years ago. It seems that as time has passed people around the country and the world have forgotten about this tragedy, its time to remember the great city of New Orleans and its people. Brad Pitt and Google+ is just a fraction of what kind of attention needs to be brought to this recently neglected issue. Support Brad Pitt and Google+, but make your own impact on the situation as well!